Being in the business of cleaning ducts for a while, we have come across some very strange things found in ductwork. Many of these things have been in there for years. There are many common things we discover in air ducts such as hair, cereal, coins, dead mice, pencils, old baseball cards, pop cans, coffee cups, beer bottles and lots and lots of dust. But what about a dead fox, a raincoat, a running shoe, a cash box, diamond rings, pieces of drywall, lunch bags, an old wooden train set, marbles and old disfigured toys? We have discovered those. 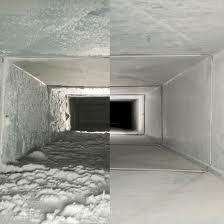 We have heard some other stories from other air duct cleaning companies as well. One company said they went out to a house where the owner was complaining about poor air flow in one particular room in their house. After using a flashlight to discover where the problem was, the company had to break through sheetrock to reach where the disturbance was. 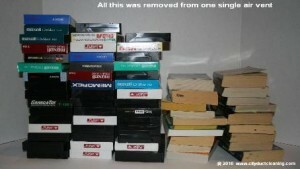 It revealed stacks of books and VHS tapes that had been missing for months, according to the owner. His kid had been taking them and dropping them through the big slots of the air ducts from above and it had been blocking the airflow from the ducts. Sometimes you’ll end up discovering things you thought had lost a long time ago and sometimes you’ll find out the strange source of the disappearing items. Below is a clip from the NBC TV show “Community” which shows that some items will disappear for strange reasons. If you need your air ducts mended or cleansed, or have to get your vent relocated or are wondering if you can have more airflow within certain parts of your property then call American Duct Cleaning, Inc. immediately at (816) 537-0318 in Missouri or (913) 681-9032 in Kansas or contact us on our website for a free consult. We will solve your air duct problem and we might even discover a strange occurrence in your duct-work that you may not have discovered before.